Cheats and codes for Resident Evil 7: Biohazard. Have you known all possible cheats in Resident Evil 7? If your answer is no, then read this article, since it’s really useful. After all, without having enough information about Resident Evil 7 secrets, weapons, characters, ghosts and other important details, the game can become really complicated. Even more, because all the cheats we are going to mention are appointed, exceptionally for the demo version, you will be able to easily complete it without much efforts. To start with, Resident Evil 7 Biohazard cheats have to begin from the secret items, which can be found really hardly. Actually, their discovery and use can be easily classified as fraud, since the game developers wanted to show them and keep in a secret at once. As a consequence, lets speak about the piano that can be easily seen in the TV room, but no one really knows its potential. In short, if you sit and play the piano for at least a few seconds, you will open the microwave in the kitchen. The second item that has a significant meaning is called axe. Even though the exact purpose of this weapon hasn’t been revealed yet, we know it was included in the demo version in order to give players an idea of what items will be used in final the release. Collecting axe, kind of reminds the process that you do while collecting a dummy finger. However, axe search is really tricky and difficult. If you want to cheat, you should follow all the steps you see below. When you will come to the kitchen, you must check the floor. Concentrate your eyes to the place, where the microwave counter and the fridge is. Suddenly, you will see a lockpick you need to pick up. Do not wait and use the lockpick to unlock the drawer you see standing in the kitchen. Even though, you will only see the empty drawer do not upset because later you will find an axe here. If you are interested what this item can do, it simply works as a great tool to smash the boxes upstairs, or hurt your enemy in general. 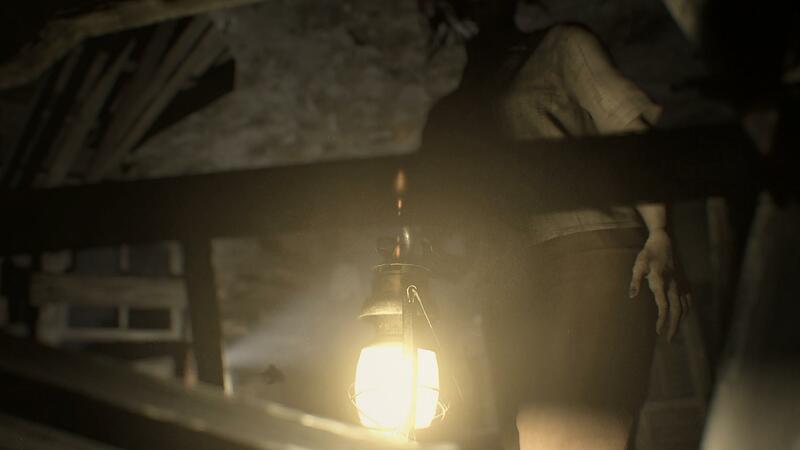 Another and one of the basic Resident Evil 7 cheats is knowing about the secret ghost that appears in the demo version. So far, we noticed that this ghost who is actually a woman, can be seen thought the kitchen window only, on the secret stairs in the VHS tape and also in many other places all around the neglected house. Unfortunately, we wasn’t able to find out who this woman is and what is her role in the Resident Evil 7, however, we think, she is scary enough. You tried to escape from the bedroom and Marguerite’s traps, but you cannot succeed? Listen very carefully and follow our advice if you want to change your recurrent destiny. 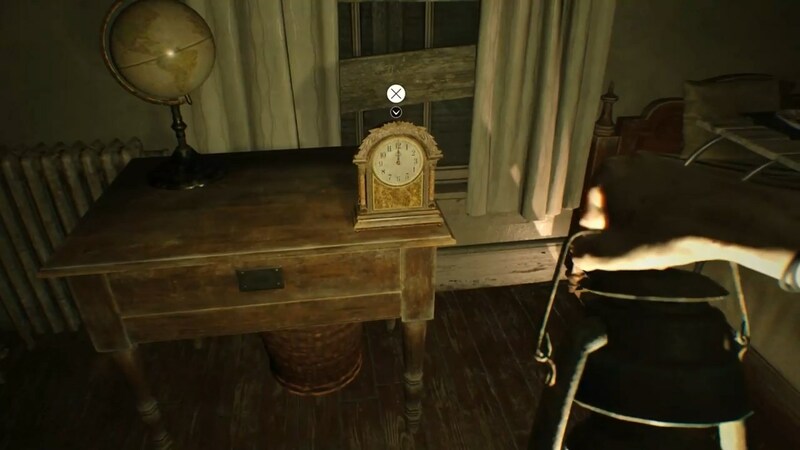 As the best Resident Evil 7 cheats and tips confirms, first you need to be very focused, because the bedroom is one long puzzle that can be really hard to understand. They main key to success is doing everything step by step by letting Marguerite think that nothing really happened. More precise, your mission is to get out of bed, solve necessary and important tasks and then, just get back to the same bed without releasing no sounds or making trouble. The thing is, if you will be able to do everything right, Marguerite will check you and easily walk away leaving the room. However, if you will fail, you will be caught and most probably killed. Want to avoid such ending? Read further and follow all Resident Evil 7 cheats. First, you are going to see a dirty plate with some gross food in it, a simple spoon and of course a handcuffs. Do not think much and take the spoon and remove the wrist lock in order to leave the bed. Then, just grab a lamp you see near the bed and begin the journey. 3. Be sure you do not touch the stuck drawer! Then, just listen very carefully because you will get a message about a strong pull that can be opened in a second or more. Unfortunately, it won’t be possible to close it and most probably, Marguerite can see it. 4. Then, you will need to find a clock, which will be hidden on the other side of the bed that you left. 5. Use the clock to break a hand. Such step will give you a lockpick. 6. Finally, open the grandfather clock. After you do all these steps, you will see that opened clock will begin to ring, bringing the Marguerite back to the room. Here, you have only two options. One of them, is pushing on the next bit or you can go back to bed, pretending you are sleeping. The decision you choose depends on you. However, don’t forget to be clever and leave everything as you found previously. Finally, you will have the access to 3 different paintings and you will need to use them. Make sure you don’t care about the bugs flying all over your face or wine bottles that grabs your attention. 7. Pay your attention to solve the painting puzzle. It won’t be difficult, but it still requires some knowledge and concentration. All you have to do, is try to match the shapes to the outline in order to open the book. After this step, you will be awarded with the sewing needle. 8. Put all the paintings back where you find them. Don’t let Marguerite suspect you. 9. Now, you must use the sewing needle that will let you set the bedside clock. Make it 5 pm and then you will see how bed moves, revealing a secret door. (Don’t be afraid of loud noise you will here, because you can’t do nothing about it). 10. Clean up everything, reset the clock and finally, just jump in the bed, pretending you that you fell asleep. 11. You will hear Marguerite is coming back. So be silent and wait until she will leave again. However, do not forget to take a stove and fork she fill bring, since they will be really useful. She is finally gone? Get out of bed and follow other steps. P.S. Before that, check the fork and spoon. The fork should have a symbol of snake and spoon should have an apple. You can clearly see it? Good then. You are ready to find a padlock and mess with it in order to open the next room. 12. Get in the room. 13. Open the drawer using the fork. Then, you will see the fuel you need to pick up. 14. Combine the fuel with the stove. 15. Hurry back in the main room and close the doors carefully. 16. Look back to the barrel and take the paintings away from it. 17. Reveal the bugs and wine bottles you saw previously. 19. Work fast and don’t make any thoughtless actions, because Marguerite can hear the noise and catch you forever. The light you see, will burn all the bugs and open the wine bottle. Now, just go back to your bed, because only few steps are left until you will finally escape. 20. Now, you will have to make a sculpture. Corkscrew and wall hooks will help you to do this. 21. Immediately after these actions, you need to find a hidden note that will be placed in the jacket. Take it out and read all about the knife bonded to the wall. 22. Open the projector using the knife and add the lantern inside it. 23. Active the shadow key that can be visible on the women face. You can easily do it using the sculpture. 25. When you see the gates are opened, instantly take the snake key together with you. Finally, you will again face Marguerite. However, this time, don’t be afraid because you need to injure her. Use the knife or anything you see around. Remember, you have only few minutes to get out of the room, so you need to be really fast. Without much thinking just make the clock to move the bed, use the key and run as fast as you can. The end is here guys!